The contract to build this new generation of self unloading lakers was awarded to Chengxi Shipyard of Jiangyin, Jiangsu China. The third of four nearly identical sister ships, Hull CX9303, was launched July 23, 2012. She was christened Whitefish Bay (2) alongside her sistership Baie Comeau (2) in a joint ceremony taking place on November 16, 2012. After successful sea trials, the new vessel departed China on May 16 to begin her delivery trip across the Pacific, through the Panama Canal and on to Montreal QC. She successfully arrived at Montreal on July 9 where she stayed until July 21st having the temporary hull strengthening removed that had been installed for the deep sea voyage, in addition to other minor modifications to prepare her for entering service on the Great Lakes. The name Whitefish Bay has been associated with CSL since 1960. The first Whitefish Bay was launched on November 23, 1962 at Davie Shipbuilding, Lauzon PQ. This vessel measured 730-feet long by 75-feet wide by 39-feet deep and was powered by a Parsons Marine Turbine Co. 10,000 SHP steam turbine engine, giving her a rated service speed of 15 knots. This ‘Bay Class’ straight decker was converted to a self unloader in 1969 and renamed Quetico. The Quetico operated until 1983 when in a unique instance, was re-converted to a straight decker and given back her original name. The old bulker put in another decade in the grain trade until she was retired. Sold for scrap in 1993, she was towed to China to be broken up ironically where her successor would be built almost 20 years later. 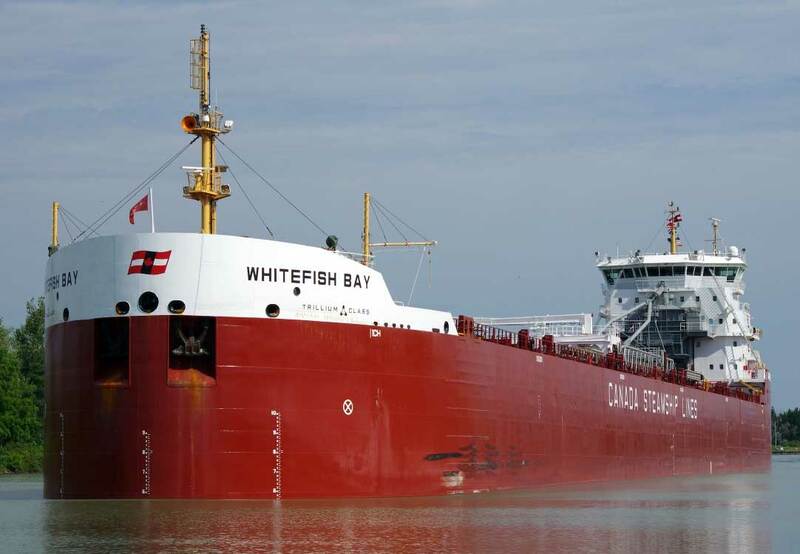 The new Whitefish Bay measures 740-feet long by 78-feet wide and 48-feet deep. The self-unloader's 25 hatches feed into 5 holds where she can carry approximately 37,690 tons at the mid-summer draft of 29.5-feet. The vessel displaces 8,101 tons lightship. Her self-unloading equipment consists of a two-belt gravity fed system with a ‘C’ type loop belt elevator that feeds a stern mounted discharge boom that can unload at up to 5,450 tons per hour. Motive power is supplied by a single M.A.N B&W 6S50ME-B9 6-cylinder, slow speed diesel engine producing 8750kw or 10,680 BHP. Power is transmitted directly to a single controllable pitch propeller that can push her to a service speed of 13.5 knots. She is equipped with both bow and stern thrusters. The ship is up to 5 percent more fuel efficient than CSL's previous class of ships, and will save approximately 750 tonnes of fuel per year – amounting to yearly carbon emissions reductions of 2,400 tonnes. The Whitefish Bay departed Montreal on July 21, 2012 on her maiden voyage on the Great Lakes system. Her first port of call was Windsor ON to unload a partial cargo of ballast stone that had been loaded in China for extra stability during the Pacific crossing. After a successful discharge, she proceeded upbound to Superior WI to take on her first paying load of coal for the transshipment facility at Quebec City.